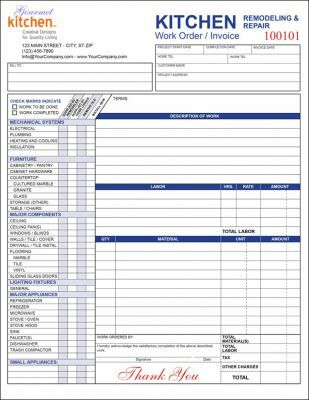 A computer or hand fillable kitchen remodeling work order form to help get the job done! Work list and checkboxes specific to the kitchen remodeling industry make write-ups quick and easy. Areas for description of work, labor and material itemization and customer approval signature. Itemized list may be fully edited to meet your own business needs or use the form for other remodeling work such as bath, bedrooms, etc. 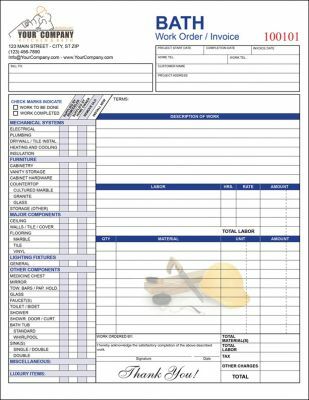 A fillable form to fill in by computer or by hand, this Bath / Bathroom Remodeling Work Order and Invoice form helps get the job done! Work list and checkboxes specific to the bath remodeling industry make write-ups quick and easy. Areas for description of work, labor and material itemization and customer approval signature. Itemized list may be fully edited to meet your own business needs or use the form for other remodeling work such as kitchens, bedrooms, etc. 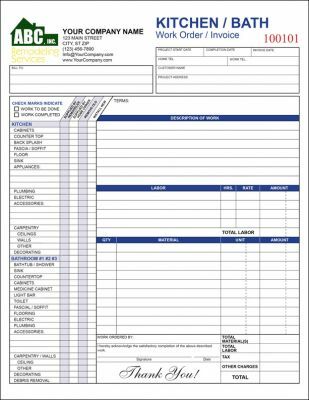 This all purpose, fillable form is good for kitchen and bath can be used as a work order, service call, repair, installation, remodeling and invoice. Work list and checkboxes specific to the bath remodeling industry make write-ups quick and easy. Areas for description of work, labor and material itemization and customer approval signature. Itemized list may be fully edited to meet your own business needs or use the form for other remodeling work such as bedrooms, patios, outside grills, decks, etc.